Patient education has been one of the primary functions of a nurse. With longer life expectancy, increasing disease chronicity and trend to keep patients at home, effective patient education has become a priority focus in health care. Unfortunately, even if patient education is an important health care function, it is subject to inconsistency and low priority. Given a single educational topic, any nurse who has an encounter with the patient/family will provide patient education that is dependent on her knowledge on the topic, teaching ability, and available time for teaching. Additionally, there was a dearth of educational materials written at appropriate reading levels and/or in languages other than English. Therefore, patient education posed a serious challenge to the health care industry. Limited resources: the department was not to add staff nor work hours. The department consisted of six nurses who were on-duty 8:30 AM – 8:30 PM (Monday – Friday) and 8:30 AM – 5 PM (Saturday, Sunday and holidays). The nurses were only able to teach basic survival skills for patients with Diabetes prior to discharge. No consistent education since no one taught the same information exactly the same each time. Increasing number of diabetic patients being admitted. Many occasions when the nurse was ready to teach but the patient/family was not ready to learn. This often led to missed opportunities that resulted in patients being discharged with little or inadequate education or the discharge was delayed until the patient was taught. Faced with these challenges, the department manager met with her team to create action plans to meet the new expectation for their department. The team identified the need for a tool that would provide consistent and effective patient education without strain on the department’s staffing and hours. The team’s searches lead them to The Patient Education Kiosk by Winstanley Associates which includes the Patient Education Institutes X-Plain® Patient Education software. The Recuperation Skills Team researched the literature for new and innovative ideas to do patient education. The team learned of a patient education kiosk program that was being used by the Veteran’s Hospital and Clinic Systems across the USA. Dr. Leonard Goldschmidt, Ophthalmologist and Medical Director for Telemedicine and Medical Informatics arranged for us to view the kiosk. It is a stationary kiosk designed by Winstanley Associates located in a clinic waiting room where the patients/ families came to use the kiosk. They had educational programs on the kiosk with the ability to do an Internet search of selected health websites. The concept was what was needed but the inpatient setting needed something more portable. Dr. Goldschmidt suggested that we work with Winstanley Associates who had designed the kiosks used at the Veteran’s Clinics. 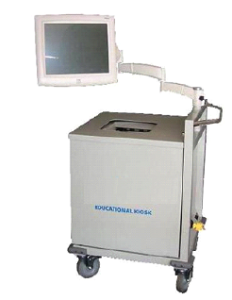 September 2004, the hospital started with one portable patient education kiosk that was designed by Winstanley Associates and the Recuperation Skills nurses. It consisted of a 13-inch touchscreen monitor attached to an adjustable arm. It was attached to a metal square box, which housed the printer and CPU. The unit had four locking casters with a handle, which made it easy to push and maneuver around the patient’s bed. Because of the increasing number of admission of diabetic patients, the group chose to start with the X-Plain® Patient Education Diabetes Library published by the Patient Education Institute. The task to educate them about their disease and how to do self-care at home before they were discharged was the department’s greatest challenge. With its limited resources, nurse time and staffing, the department’s staff members were only able to teach the patients and families survival skills until they could attend a class on Diabetes. This resulted in some unnecessary Emergency Department visits and readmissions because the patients didn’t understand the information presented or they were not ready to be taught when the nurse had the time and were discharged with little or no information. The Diabetes Education Library consisted of various topics or modules, similar to chapters in a book. The topics included Introduction to Diabetes, Type 1 and Type 2 Diabetes, Diabetes and Meal Planning, How to Inject Insulin, Foot Care, and others. As an HMO member, the patients are discharged with a certain glucose meter. This led the group to develop a topic on Using the Blood Glucose Meter. Next, the dietitians wanted a module on Carb Counting. This provided the impetus for this Team “to customize our education for the patients”. 1. Staffing – need to be able to block at least 30 minutes to do the education each shift per nurse. Simple versus complex education can take 120 minutes or more. What happens on days when staffing to care for patients is a challenge? How much time is allocated for patient teaching? 2. Patient readiness to learn – nurse had the time to present the education but the patient is in pain, scheduled for a test or the family member caring for the patent is not available due to work or child care schedules. The Educational opportunity is missed. When the nurse has the opportunity to educate, will the patient be ready to learn? Will the family member be available? This could cause a delay in patient discharges to home. 3. Missed opportunities could mean delays in discharges or patients discharged with inadequate education. This could translate into higher patient care costs; increase patient length of stay, lack of information to do self-care at home causing an emergency department visit or a readmission to the hospital. 4. Consistent education – the education content was always the same ensuring that all the key aspects of the topic were covered. Nurses that were not as familiar with the education topic now had a tool to help them educate the patient/family for discharge and/or self-care. It allowed for the patient/family to choose their learning preference: audio, visual, reading. The patient education kiosk program has proved to be very successful. The nurses have embraced it as a tool to help them provide quality care and patient education. The education is consistent, timely and allows the nurse to provide the necessary education for discharge and self-care at home. Patient and nurse satisfaction is high. Since it is available 24/7, the burden of education does not fall to one shift but can be done when the patient/family is ready and/or available to learn. Over the years, Winstanley Associates has listened to the comments from the patients and nurses to streamline the kiosk without diminishing its functions. Over a 10-year period, the Patient Satisfaction Evaluations have been consistently rated at the 97 to 98 percentile.